So after 14 years, two children and a frugal lifestyle, it was finally time to upgrade the car, which was showing signs of needing expensive repairs and still not being OK anymore. We have considered the one-car family option, but since I would expect it to be me who had the one car for daily runabouts, I can't push this one hard. Our upgrade wish list included a fancy to invest in advanced motoring technology that uses less petrol. New Zealand has not yet integrated public charging stations for fully electric vehicles, but some clever online shopping by the DH resulted in quite a special deal from far away from the big smoke: a tidy 10-year-old Toyota Prius with less than 40,000 ks and a certified service history. Of course a newer car is always a pleasure to drive, and the whole family is helping to keep it in its original tidy condition instead of its natural state of the "family car". And it is really really quiet ! We call it the sneaky car, because you often can't hear when it arrives in the garage. Unless the tires squeak. While I drive it, I get instant feedback on how much petrol I am using vs how much battery power. It's very motivational - it's like a driving game where I see how long I can run just on battery power before running out, or getting to the next hill so I can recharge. If nobody is following me I will often drive much more slowly than I used to, just to keep it on battery only. It's only a few hundres metres to the next corner anyway, so what's the rush? "I'm using no petrol!" And it is educational to see how just THIS much more pressure on the pedal spends your petrol THAT much faster. I think every car needs this even if it's not a hybrid. While I love the extra storage the hatchback provides compared to our previous sedan, I absolutely hate the reduced visibility in every corner and behind the car. Squashed window and a spoiler - I can't see! DH has kindly installed a high-tech tennis ball feature in the garage so I know when I am finished parking. I'm sure that like me, when you read about hybrid or electric technology and see the theoretical efficiency, you still wonder how that really translates to real life, especially when hybrids are more expensive to buy than their regular counterparts. So I'm very happy to report that I am regularly, easily, getting twice the distance from a tank of petrol in the Prius as I did for the old Nissan Sunny. Really: 400km when running the Sunny to the fumes at the bottom of the tank, and 800+ no problem on the Prius. 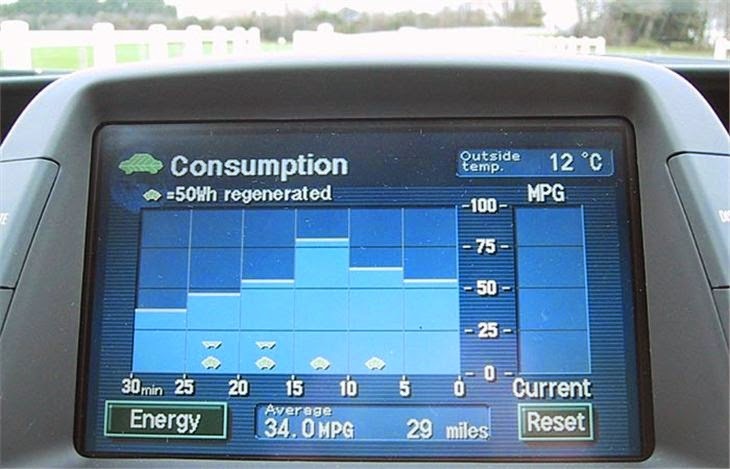 Modify that gain slightly because the Prius runs on slightly more expensive petrol. But even so, we are doing about 1 fill per month instead of 2 - say about $80/month or $960 per year - this should eventually provide our ROI plus the satisfaction that we are using that much less petrol to get around.